Did you know that Peruvian cuisine was listed among the top 3 of the nation’s hottest foods this year? 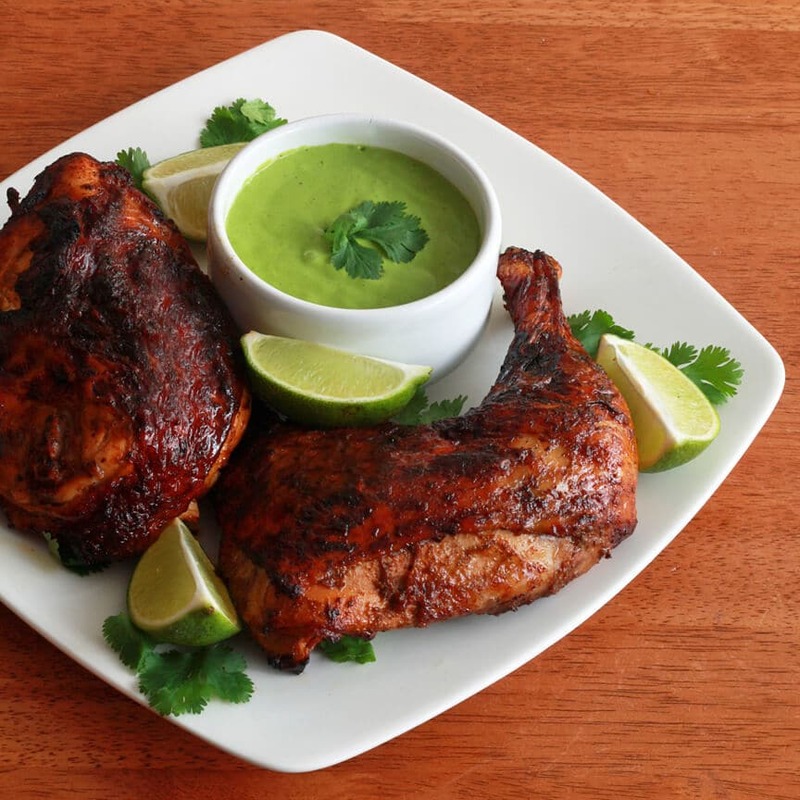 And did you know that Pollo a la Brasa was ranked #1 as the most popular dish in Peru? There is even a designated national day for it in July! Yes, Peruvians love their famous roasted chicken, and so do we!! Now you can make it at home and it’s so simple! Make the marinade, let the chicken marinate, roast the chicken in the oven…that’s it! Oh, and take an extra 5 minutes to make a lovely Peruvian Aji Verde Sauce to accompany the chicken (recipe provided). SATISFACTION GUARANTEED. 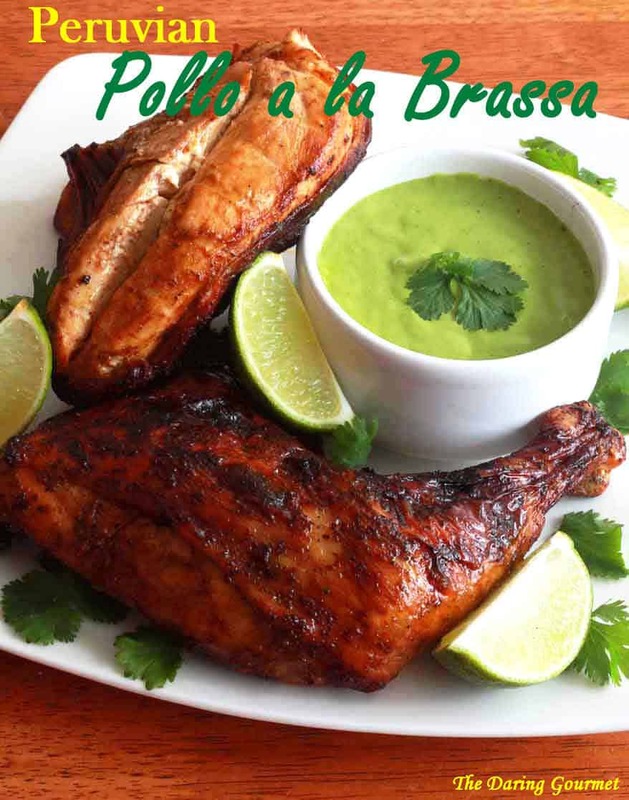 This recipe comes by way of special request from Lajoiedu (“Make a Request!“) who wanted a recipe that imitated the Pollo a la Brasa she and her husband enjoy at a local restaurant. Her description of this dish is beautiful. Who wouldn’t want to eat that? With such detailed specifications and no aspect left out – everything from flavor to texture to aroma to appearance – I’ll admit I kind of gulped for a second at the thought of such an undertaking. But you know how I love challenges and this one left me feeling inspired! So with my two little ones running around me, finger-painting the kitchen window, squashing Play-Doh on the floor, and banging pots and pans, I got to work. Now, I have no idea whether this tastes anything like Pollo a la Brasa at that particular restaurant she described. And really, it’s not going to taste the same without the special wood-coaled rotisserie’s they use. But is the end result authentic Peruvian in its flavor profile? Yes. And does it taste good? Yes. And let me add this: I have never seen my 3 year old devour chicken as fast as he did this Pollo a la Brasa! And he kept asking for more and more! And get this: For 4 consecutive days thereafter he kept asking for more Pollo a la Brasa and was bitterly disappointed (to the point of throwing a tantrum once) when offered a substitute chicken dish! We’ve created something of a Pollo a la Brasa addict in our son and he has since been suffering withdrawal symptoms! So yes, it looks like Pollo a la Brasa is going to be a regular in the Killebrew home from now on. And once you’ve tried it, I’m confident you’ll do the same. IMPORTANT NOTE: Besides a great marinade, the key to great Pollo a la Brasa is the actual cooking method which involves a rotisserie over wood coals to give it that sublime smoky flavor. Most of us don’t have the equipment necessary for that, so this recipe uses a conventional oven to achieve that perfectly crispy skin while leaving the meat delicately tender and juicy. 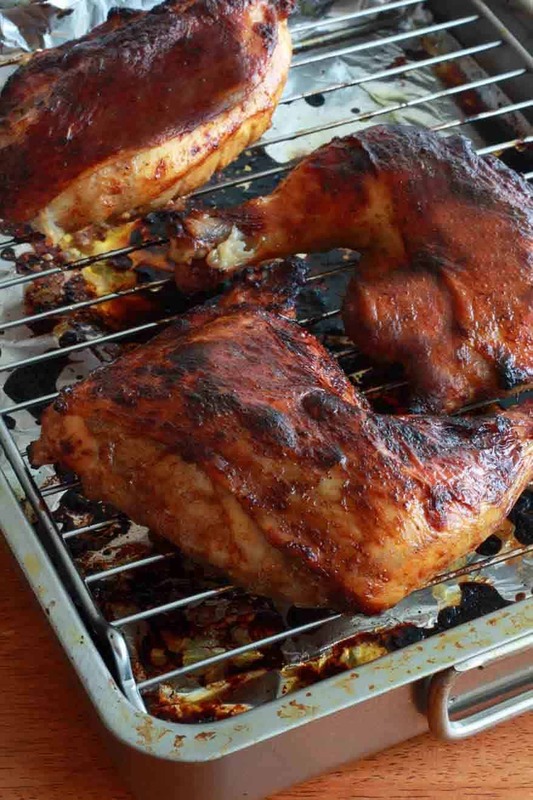 So this is the best it’s going to get without a wood-coaled rotisserie – and it’s really good! Two quick things: I used the convection setting on my oven. It really made the skin crispy while leaving the meat tender and moist. You don’t have to use a convection oven, but if you do, be sure to keep an eye on the chicken because it cooks much faster than in a conventional oven (see instructions). The other thing: You must use a roasting rack. That allows the air and heat to circulate under and around the chicken to prevent the chicken from sitting in its juices and to produce the crispy skin and even cooking. And of course, for all you BBQ’ers, barbecuing is another great alternative! Come join The Daring Gourmet on Facebook for more cooking fun! 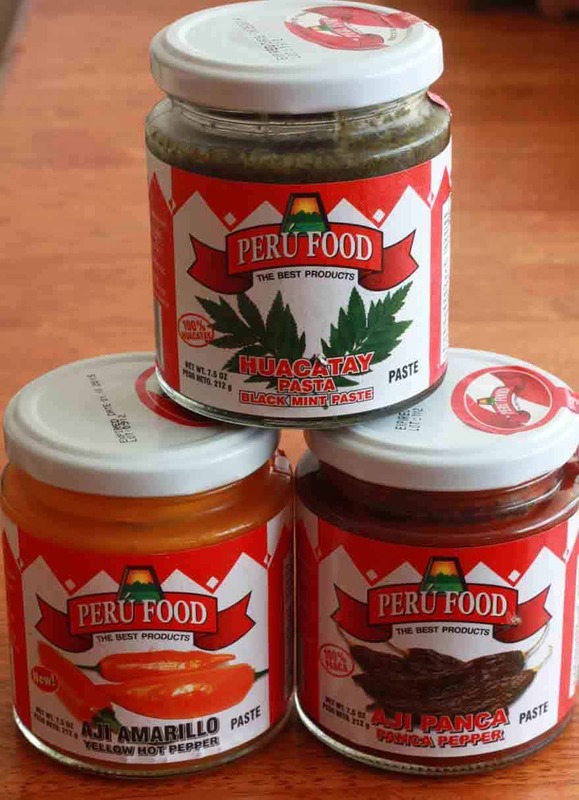 You’re going to need 3 key Peruvian ingredients (2 chili pastes and a black mint paste from an herb indigenous to Peru). I picked these up at a local Mexican grocery store. If you don’t have one, you can purchase them online here: Aji Panca Paste, Aji Amarillo Paste, Huacatay Paste. 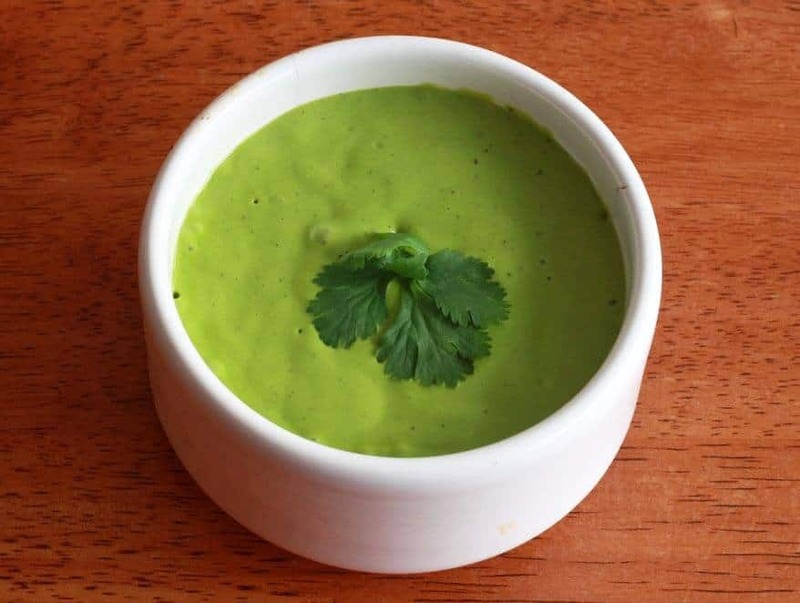 (You’ll need the Aji Amarillo paste for the Aji Verde Dipping Sauce that is traditionally served with the chicken). 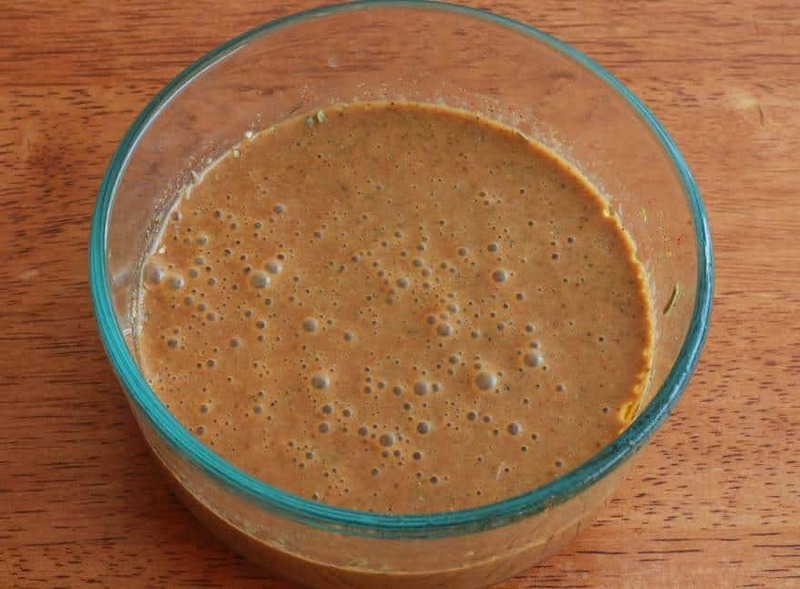 In a food processor, blend it to a smooth puree. Yes, this is the magical concoction here. The marinade is enough for one whole chicken (you can either roast it whole or cut it in pieces). But you can use whatever bone-in/skin-on chicken pieces you want. This time I just used two leg quarters and a breast. Loosen the skin and rub some of the marinade under the skin. Then put the chicken pieces in a large ziplock bag (or you may need to divide it in two bags) and pour the rest of the marinade over them. Swish around to coat. Marinate the chicken for at least 6 hours or overnight, turning it every now and then evenly marinate the chicken. 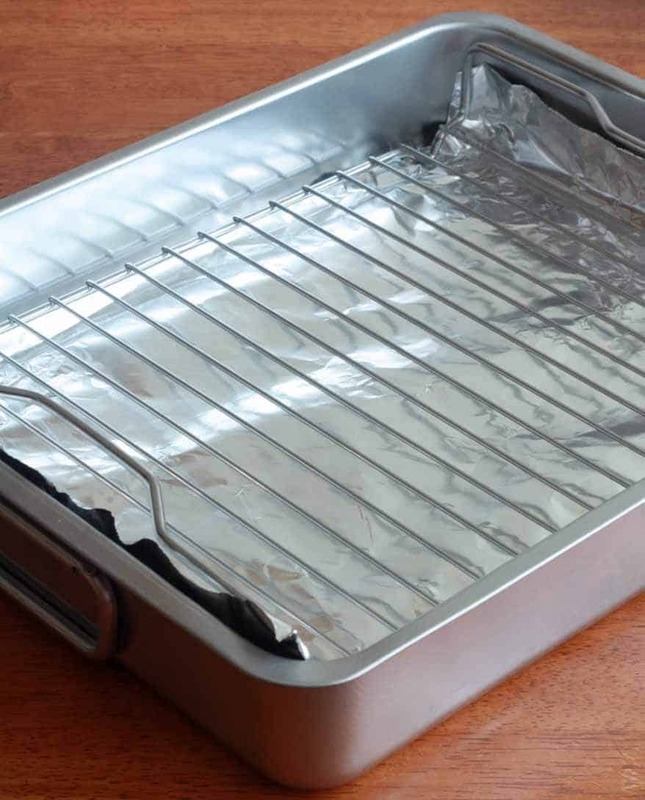 Place some foil under the rack of a roasting pan (this will make cleanup much easier!). You can get a good, inexpensive roasting pan HERE. Lay the chicken pieces on it. Spoon some extra marinade over each piece. Preheat the oven to 425 degrees F (if using a convection oven, adjust the temperature and cooking time accordingly) and roast the chicken on the middle rack of the oven until the internal temperature of the chicken reads 160 degrees F on a meat thermometer, about an hour. If the skin begins to brown too much too fast, move the roasting pan to the bottom rack. You can also reduce the oven temperature. Note: I used the convection setting on my oven. If you have one, use it. Preheat the oven to 475 degrees F and roast the chicken for 10 minutes. Reduce the heat to 325 degrees F and roast the chicken for another 15-20 minutes. I couldn’t believe how much faster the chicken cooked using the convection setting. And the results were fantastic. It is recommended that you tent the chicken with foil for 10-15 minutes before serving. I didn’t see the need, but it is often recommended. Serve with Peruvian Aji Verde Sauce (click on link for recipe). 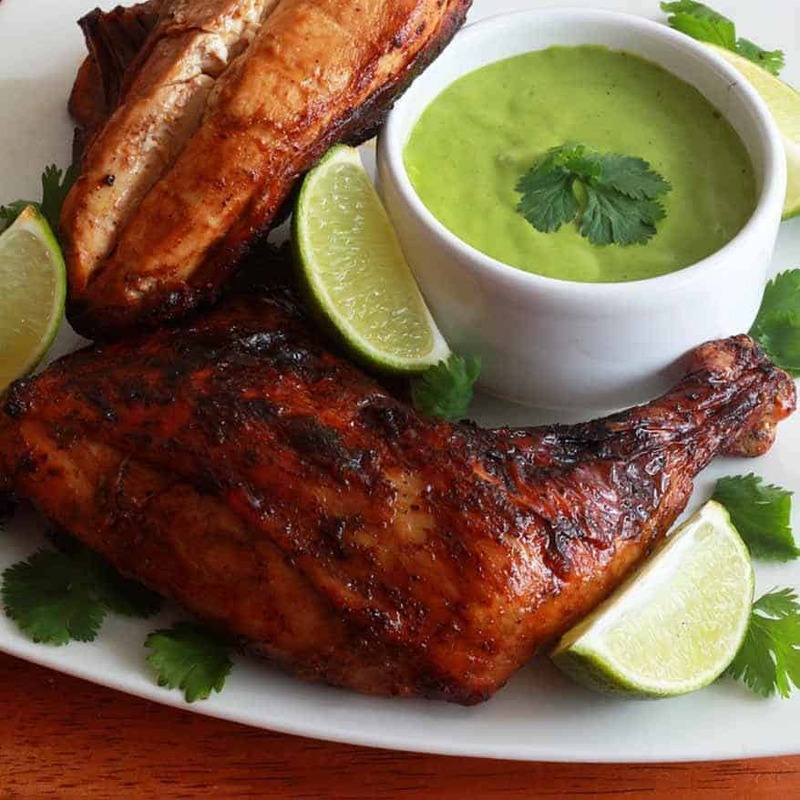 There are often two additional sauces served with Pollo a la Brasa, but Aji Verde is the standard. Traditional side dishes include a leafy green salad and thickly cut French fries. 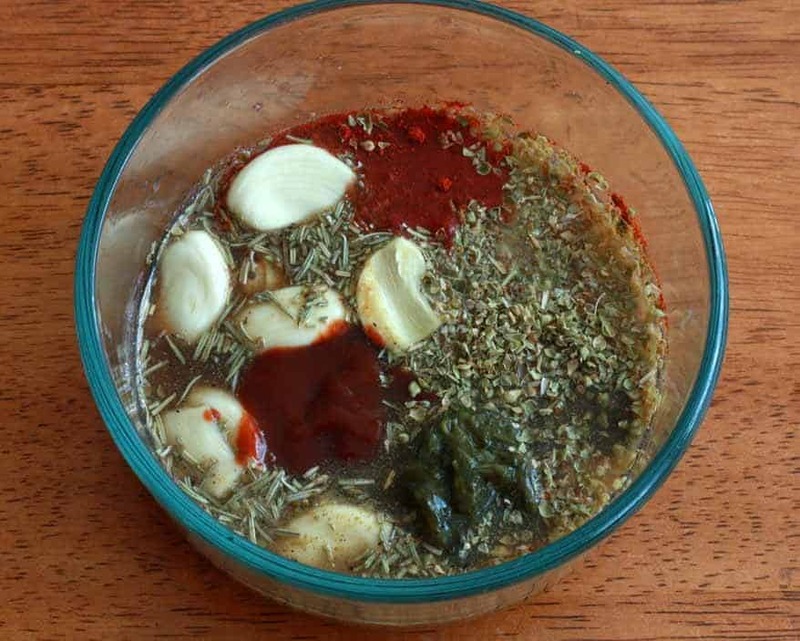 Combine all the marinade ingredients in a food processor and blend until smooth. Loosen the skin on the chicken and rub some marinade under the skin. 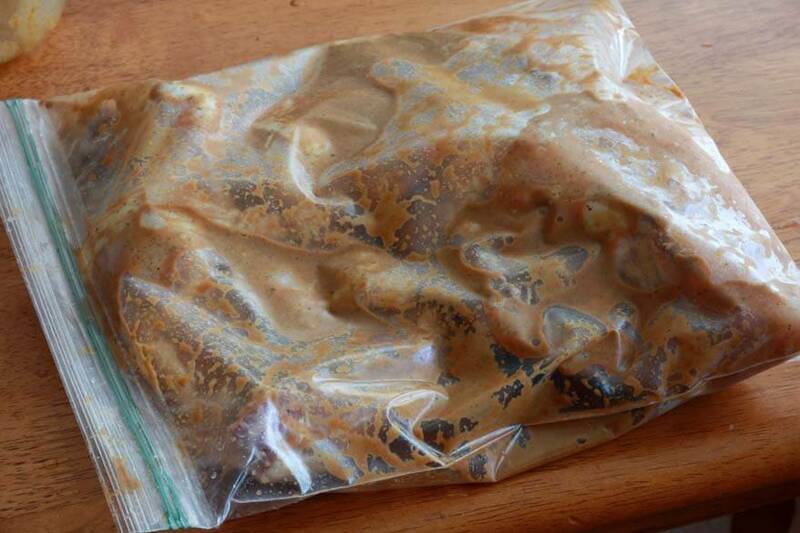 Place the chicken or chicken pieces in a large ziplock bag and pour the marinade over. Swish around to even coat the pieces. Marinate for at least 6 hours or overnight. If using a convection oven (that's what I used): Preheat the oven to 475 degrees F and roast the chicken pieces for 10 minutes. Reduce the heat to 325 degrees F and roast the chicken for another 15-20 minutes. If using a conventional oven: Preheat the oven to 425 degrees F and roast the chicken pieces on the middle rack of the oven until the internal temperature of the chicken reads 160 degrees F, about an 45 minutes. If the skin begins to brown too much, move the roasting pan to the bottom rack. You can also reduce the oven temperature. Remove the chicken from the oven. 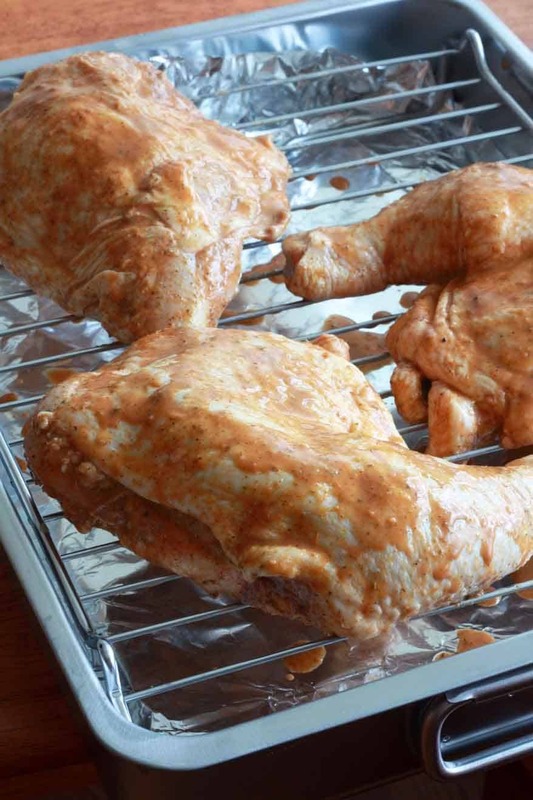 It is recommended that you tent the chicken with foil for 10-15 minutes before serving. 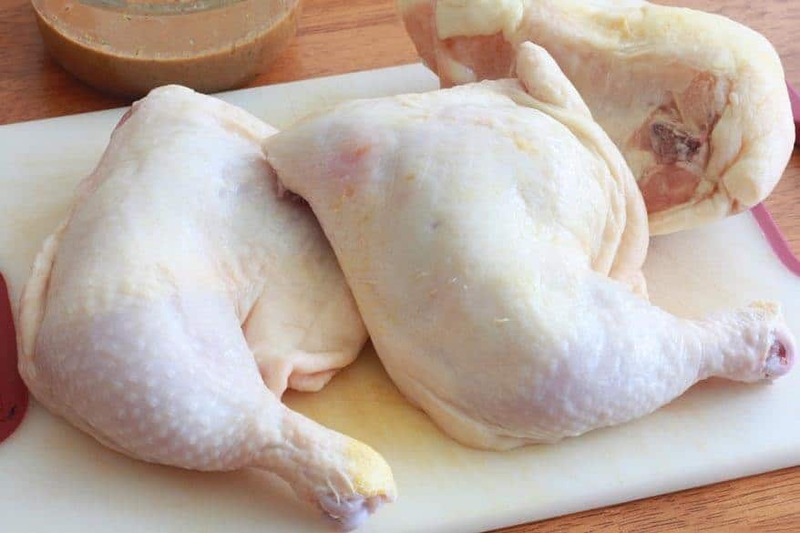 If using a whole chicken, cut the chicken into serving pieces. Serve the chicken with Peruvian Aji Verde Sauce. Traditional sides include a leafy salad and thickly cut French fries. 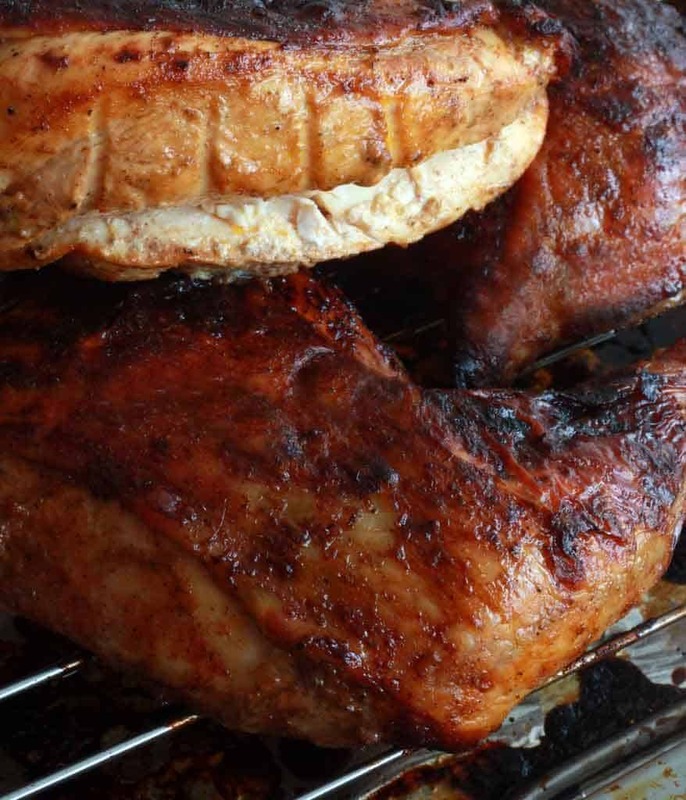 * For all you BBQ'ers, this chicken is also fantastic barbecued over coals and wood chips! * The oven-roasting instructions are for chicken pieces. If using a whole chicken, increase cooking time until internal temperature of chicken reaches 160 degrees F.
Good timing. I had never eaten Peruvian food until last night when I went to Ceviche in Soho, London. Great food, ambiance and staff. Your Peruvian fare looks equally tasty. Too lazy to make; any good restaurants which make exactly same way as you show in State of Virginia in cities of Chantilly, Centreville, Fairfax, Reston, Manassas? LOL, too lazy to make :) Part of my wife’s family is Peruvian. We eat this stuff all the time and I learned to cook a lot of it myself. I notice your name is Indian/South Asian…besides my interest in Hispanic culture and speaking Spanish, I am also equally interested in Indian culture and speak Hindi conversationally and am learning to write Telugu presently. I live near you as well ;) I would recommend you get food from Pollo Peru in the Home Depot shopping center at the intersection of Baron Cameron and Reston Parkway, although there are several other places. If you’d like to, I’d be happy to meet you in person and eat with you and discuss Peruvian food…email me at anastasios0513 @ gmail . com if so…! POLLO Peru by the Home Depot! Edy’s Chicken & Steak at Bailey’s Crossroads on Leesburg Pike is my favorite!!! Been around since I was a kid and is always busy! You’re very welcome! I really enjoyed experimenting with the flavors. Again, keep in mind, it’s not going taste like the one at the restaurant. Not having tried that one I can’t imitate the flavor. But this recipe includes all of the ingredients common to authentic Pollo a la Brasa and it’s made to Daring Gourmet specifications. :) So whether similar to the actual one you described or not, what I can say is that this Pollo a la Brasa is fantastic! It looks delectable! Can’t wait to try it! Thanks, Cindy! Looking forward to your feedback! Kimberly: I could not resist…I had to come here just to say that looking at these pictures made me insanely hungry! What a mouthwatering pollo!!! Denise, I am so flattered that you stopped by!! And coming from you the compliment is especially meaningful :) Thank you! It’s our preferred dish served here in Lima and comes with salad and a pile of french fries. Delicious. Hello, Pelusa! Lima has excellent taste! :) I hope to visit Peru someday and enjoy the Pollo a la Brasa – and many other dishes – while in your beautiful country! Thank you very much for posting this recipe. I am addicted to pollo a la brasa. While this recipe may not be exactly like the one at my favorite local Peruvian spot, it is still FANTASTIC! 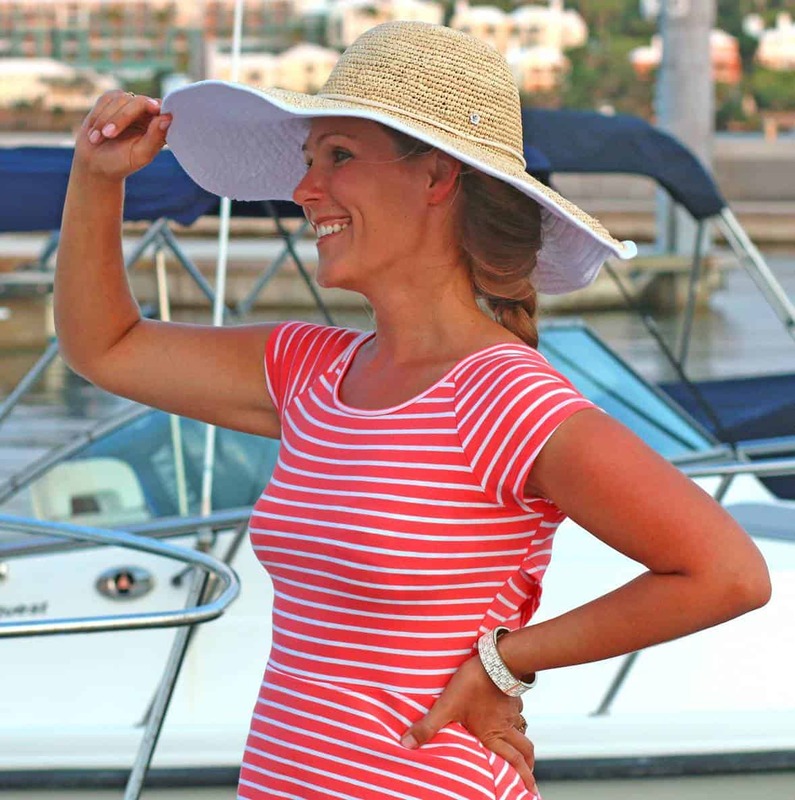 I hope you don’t mind that I will sharing this on my blog. Okay, I tried your recipe today on my Weber Kettle Rotisserie grill using lump hardwood charcoal. My only variation – I sprinkled garlic salt on the chicken just before I put it on over the coals. I didn’t have enough time to marinade the chicken for six hours or more as recommended. I think I was able to get in 2 hours, so I boiled the leftover marinade and basted the chicken as it rotated. What an amazing bird it turned out! It was soooo good. Juicy, tender and moist….with a crispy skin! Absolutely delicious. Thank you for sharing thus recipe! I married a half Peruvian woman and her mother approved the dish after I made it using this recipe. High fives to you and everyone else involved! Ok I just did this for tomorrow’S Thanksgiving…they are in ziplock bags right now…will let you know how it comes out! I know this is an older post, Kim, but this recipe was a revelation-lick your plate kinda revelation. The Aji Verde sauce pairs perfectly with it. The spiciness is unlike any other I’ve tasted, but it was love at first sight and bite. I made a green salad and some homemade grilled flatbread to go with it. We’ve enjoyed leftovers 2 nights in a row and we’re still not tired of it and it tastes as great as the first night. Valerie, I’m so thrilled to hear that and really appreciate the feedback, thank you!! I love Peruvian roasted chicken but never thought it do-able at home…you’ve changed my world. Ha, Michelle! :) Well, hopefully it’s a change for the better, we love this chicken! Thank you, Glenda :) I haven’t developed a recipe for the yellow sauce yet. I hope you find what you’re looking for and enjoy this chicken! What a fabulous recipe! Delicious!! I used a split, whole chicken. Marinated overnight. Roasted in the oven using cabbage slices and carrot sticks instead of a grate. The veggies were just as amazing in flavour as the chicken. The bones, and pan scrapings, I simmered into soup stock. Very tasty for a spicy soup. Thank you! Wonderful, leva, I’m so glad you enjoyed it, thank you! What a great idea to incorporate the leftovers into a soup, I’ll need to remember that! I am officially starving!! This chicken looks perfect! This is my kind of chicken! And I love that dipping sauce! What amazing color on those legs! All the flavors make it sound succulent and amazing! Yes, Peruvian food is one of the best and is getting so much great reputation. I love it and I need to make it at home. This chicken sounds like the perfect first recipe to try. This is absolutely gorgeous. I love roasted chicken, and this is stellar. I want to reach right into my screen and grab some. The flavor profile on this chicken sounds out of this world amazing! We love roast chicken too! We actually had roast chicken for dinner last night but mine didn’t look this good! yum! Fantastic, I’m so thrilled to hear that, Ada – thank you! Hello dear. Thank you for this recipe, I’m going to try, but as I’m living in Egypt, I can’t get black beer. How I can to replace it? Thanks a lot in advance. Hi Mikaela, I would just use whatever the darkest beer is you can find. If that happens to be a light beer, so be it. It will still taste delicious! I just came across your recipe after having some of this chicken at a church gathering. I was wondering if you have to use the alcohol that is mentioned. Is it necessary to use? Also, would it be possible for it to be left out and still have a great taste and or substitute it with something else of the non alcohol beverage arena. If so, I would greatly appreciate the name of what to use. Thank you for your response. What type and brand is to be used? Hi Tina, no not really. I don’t drink beer, I just use it in cooking so I’m not terribly familiar with a lot of the brands. My only recommendation though is to use one that has a good flavor and that just comes down to personal preference. One of my favorite food carts in Portland, OR is called chicken and guns, they serve chicken roasted over an open fire along with crusty lemon potatoes. Since the first time I’ve been obsessed with finding a recipe for Ahi Verde sauce, and this is the best I’ve tried. I’m making it again tonight! Fantastic, Vaughn, I’m so happy to hear it, thank you! This was incredible chicken! I followed your recipe, used organic thighs & marinated them about 5 hrs. Also made the aji dip…awesome! Thank you for a wonderful experience into Peruvian cooking. I’m so happy to hear that, Nanette, thank you! chicken a la brasa. This recipe is Grrrrrrrrrreat. foil off. Wings, then, are not as BURNT and DRY. I’m so glad you enjoyed this, Roger, thank you and thanks also for the tip! Finally made this after getting the ingredients off Amazon. What an awesome recipe! Chicken was delicious and the green sauce was spot on. Will definitely be my go to recipe for rotisserie from now on. Thanks for sharing!